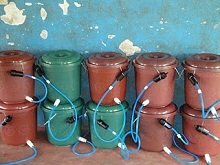 Their use of a unique form of filtration, developed from kidney dialysis technology, sets them apart from other clean water products and more conventional forms of filtration, and gives them some distinct advantages. 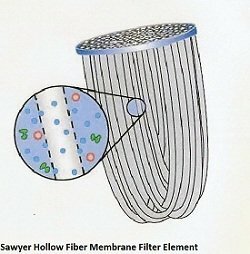 Sawyer filters feature a 0.1 Micron Absolute Hollow Fiber Membrane. When the water is drawn through the filter, it flows through the side walls of the Hollow Fiber tubes. Filter effectiveness is outstanding and they are capable of physically filtering out bacteria, protozoa, and cysts, like E. coli, cholera, and typhoid, with no additional chemical disinfection required. The pores in the filtering material are no larger than 0.1 microns, making it impossible for bacteria to pass through. the authorized distributor of both brands of filters. One of the biggest advantages of Sawyer filters as a is that filter assembly and maintenance are extremely easy. Back-flushing the filters may only be necessary every 1000 gallons or so, if a relatively sediment-free source of water is being used. As mentioned above, if turbid water is used, back-flushing may have to be performed on a daily basis. Nevertheless, back-flushing is easy to do and does not take any time at all. * The filter itself (since there is slight variation in flow rate between individual filters). A Sawyer PointONE Filter with a hose that is one foot long, using a standard 5-gallon bucket at sea level is capable of filtering up to 295 gallons (1117 liters) of water each day! This compares very favorably to other filtration methods, like biosand filters. If you lengthen the hose or raise the bucket or increase the size of the bucket, the flow rate will increase. Sawyer filters do not afford any protection against chemical, pesticide or arsenic contamination, and they do not remove salts from the water, as some other clean water products do. If you use Sawyer filters and are in a situation where these kinds of contaminants are an issue, then further water treatment would be necessary after filtration. There have been a lot of field studies and anecdotal experience with Sawyer filters in different parts of the world. Indications are that they are reliable and effective water filters and are an excellent solution to water filtration needs. Return "Home" from "Clean Water Products"
Sawyer Filter Assy. and Maint.